Dreary winter clinging to the month of March. Sickness hovers over my family like the low stratus clouds overhead. Unending desire to wear sandals, yet feet confined by well-meaning but still-restrictive socks and shoes. Motionless shadows, missing the sunbeam’s instinct to change things up with every passing second. Hibernation is lazy living, but requires such mental work to skirt the pit of despair. Mopey days pass into worn-out nights, but I can’t recall actually doing anything in the last 9 hours. Husband is traveling; loneliness tempts me to withdraw, sink in, and fade. Broken stroller wheels and worn out legs halt my energetic-walk initiative. Muddy streets make dirty cars. My attempt at “wearing” Spring into existence fails when a sleeve of cheery white brushes against the dust-caked vehicle. Apathy settles in, and flows out, of my thoughts, actions, media choices, and my words. Have I lost all sense of life, passing through each day like the stuffy hot air passes through our heater vents? Zombie-like, I muddle through the motions. The house is clean, the laundry done, the babies fed, but my senses of adventure, hope, and laughter seem to be on vacation. Maybe that’s what I need… a vacation? Or perhaps what I really need is 2 pumps of delicious truth with my morning latte. A bit of Scripture-sunshine to pierce the self-absorbed darkness of my heart. I need the same encouragement Paul gave to the people in Ephesus: you are alive with Christ! This truth about my identity rings clear above the hum-drum noise of my circumstances. I have the choice to stop living as one dead in her sin, one decaying with passing time. Though I sometimes feel like I am falling apart, that is not who I am. No, I am not a corpse, I am alive! God has given me a new identity. I can live as such! As one who is alive with Christ, I can embrace each day with energy not found within myself. By the power of the Holy Spirit living in me, I can breathe deep, worship, smile, and wake up with happy anticipation. 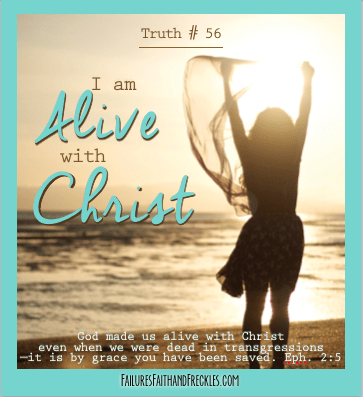 Hallelujah, I am alive, and therefore, I can really live! For more about this truth, see my series on Zombie Christianity.